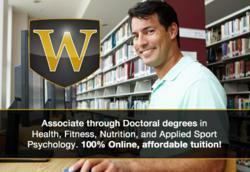 Summer session for Wexford University’s online master’s degree in nutrition and exercise begins on June 24. The flexible online wellness degree program prepares students for lucrative careers in the health and nutrition industry. Earning your degree in exercise and nutrition gives you a solid foundation for a rewarding and lucrative career. Summer is all about fresh produce, fresh air and a fresh approach to eating and living well. Summer is also the perfect time to start an online master’s of science degree in nutrition and exercise from Wexford University; the flexible summer session begins June 24. Interested students can learn more and register now at http://wexford.edu/degree-programs/master-of-science-degree-in-nutrition-and-exercise/. The degree program is designed to prepare students for growing careers in weight management, nutrition advisement, healthy living coaching, writing, health club operation and more. The online degree from Wexford University is designed to prepare students for a valuable career in the health, nutrition and fitness industry with a focus on critical thinking, developing a professional practice, the latest industry research and the ability to develop an effective health-based program. Students can use the online master’s degree in nutrition and exercise to prepare for work in clinical environments, further educational study, research, health club management and work, and more. Wexford University is dedicated to providing world-class education through cutting-edge technology, offering direct application degree programs in an accelerated format with 100 percent online learning to save time and money. Programs include an associate of arts degree in Fitness Training, bachelor’s degree in Health and Fitness, master’s degree in Nutrition and Exercise as well as master’s degree and doctorate degree in Applied Sport Psychology. Wexford University is the higher education division of NESTA (National Exercise & Sports Trainers Association). For more information, please visit http://wexford.edu/.